A complete kitchen remodel can be a stressful undertaking in the best of times. Ours was done in 2009, during the depths of the so-called “Great Recession.” The existing kitchen had too many problems– everything from poor workmanship and cheap materials to code violations– that it would have severely hindered any potential sale had we been forced to relocate. Whether we stayed or moved, the kitchen remodel was a necessary investment. We knew when we bought the house that the kitchen was going to need some work. 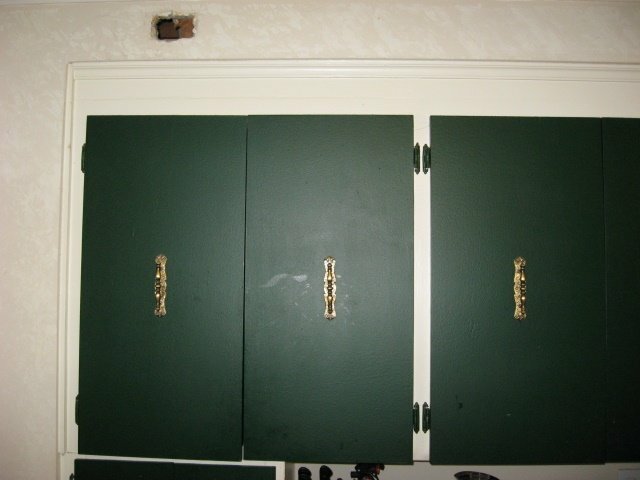 The painted cabinets appeared to be functional, but the slab particle board doors held no aesthetic value. We didn’t care much for the peel and stick tile floor either. It wasn’t pretty, but it also wasn’t a priority. We figured that we would eventually get around to refreshing the kitchen and that we could keep the costs down by doing it ourselves. Unfortunately, as time went by, we discovered that our kitchen had deeper issues that required more than just cosmetic fixes. 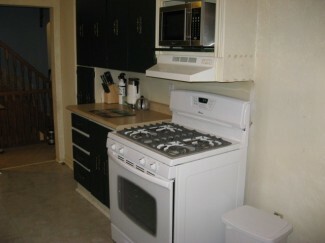 Barely visible in this picture is the stove and counter space on the right hand side. The refrigerator was originally next to the stove. The refrigerator and stove should not be directly next to each other, mainly for energy efficiency reasons, but also for practical functional reasons. It’s simply not a convenient layout. The location of the hall doorway created a high traffic zone in middle of the work zone which was a safety issue, especially when hot food was involved. The dishwasher was located in the end of the peninsula, resulting in a narrow passage between the dishwasher and the stove. When the dishwasher door was open, there was insufficient room to pass. Despite the appearance of abundant counter space, the actual work surface was quite limited and awkward to use because the upper cabinets were less than 18 inches above the counter-tops. The worst offender was the peninsula. The upper glass cabinet was only about a foot above the counter top. 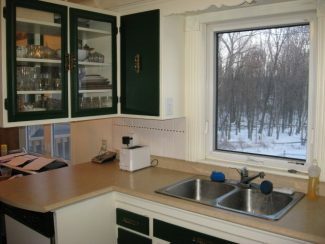 Without enough room to use this space for food preparation, it became merely a drop zone for dirty dishes. The glass cabinet above the peninsula exhibited another problem. The fixed shelves limited what could be stored. 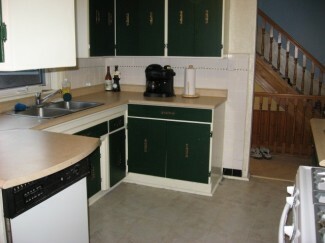 In fact, despite appearances, there really wasn’t a lot of useful storage space in the kitchen. 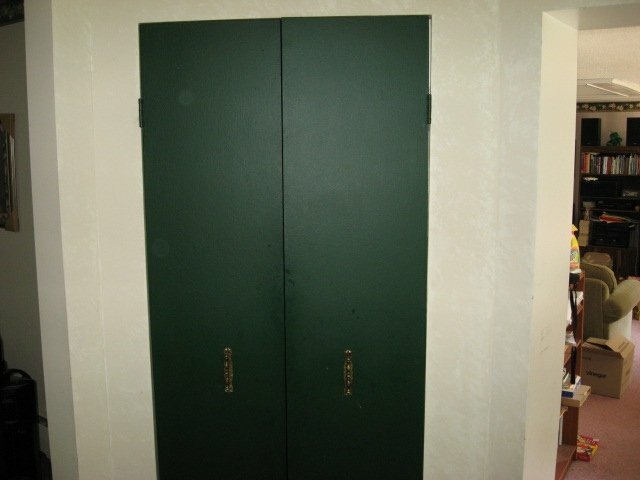 For example, the chimney was behind one door, reducing the usable space to less than four inches deep. 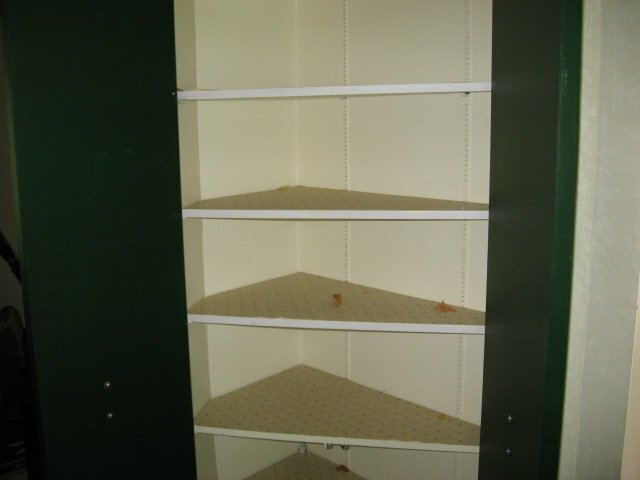 Elsewhere, fixed shelves and narrow doors limited our options for storing certain items. The inconvenience was a source of great frustration that continued to build over the years that we had to live with it. Glass cabinet was too low over peninsula. Fixed shelves did not allow practical storage. The chimney took up most of the room behind the 2 cabinet doors to the left. Can you spot all the code violations in this picture? Pictured to the right is the stove, microwave and counter we used for most of the food preparation. The fridge used to be directly beside the stove, but we moved it when we removed the built-in pantry. The range hood was too small and installed too low. And because it wasn’t vented outside, the filtered air was recirculated– directly at face-level. Needless to say, the hood was rarely used. You can also see in the picture that the stove is below the level of the counter, so we had to leave an unsightly space between them to reduce the fire hazard. What you cannot see in the picture is what was going on with the electrical. Originally, the circuit servicing the kitchen was overloaded with about 15 fixtures including the fridge and microwave (which both need to be on dedicated circuits) as well as other counter plugs and overhead lights. After splitting up the circuit, the counter plug in this picture was no longer connected and the microwave still tripped the breaker often. More work needed to be done but the incentive diminished as we learned to live with the problems. To understand everything that was wrong with the kitchen (or indeed, our house), you need only take a look at the built-in pantry. At first it was a selling point. 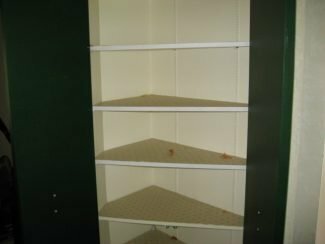 We moved from a house that had a kitchen with very little storage, so the built-in corner pantry was an attractive detail. However, we found out that the triangular design was not very practical. Small stuff had a tendency to get lost in the back corners of the shelves. And large stuff, well, just try lining up a row of cereal boxes on a triangular shelf. A traditional rectangular shape would have been better. The pantry appeared larger than it was. Practical storage space was lacking. Plug was buried behind drywall. And like other selling points of the house that turned out less practical than first appearance, the pantry was also hiding a nasty little secret. In 2006, we upgraded the plumbing for the hydronic heat and the undersized pipes running up to the second floor had to be replaced with ones of the proper size. As luck would have it, the pipes were located inside the wall behind the pantry. In order to gain access to that wall, the pantry had to be sacrificed. 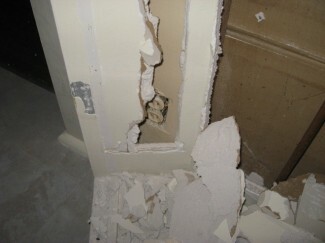 Demolition uncovered a LIVE plug that had been buried behind the drywall forming the outer wall of the pantry. Obviously the pantry was built well after the original electrical work was done and whoever built the pantry took no steps to disconnect this plug that was in the way, chosing instead to go ahead with construction as if the plug wasn’t there at all. Out of sight, out of mind, I guess, much like most of the other renovations previousuly done in this house. With the pantry removed, we were able to address a couple problems. We now had another space where we could put the fridge. Knowing that the kitchen would eventually be remodeled, I didn’t even bother investing in new drywall to patch the hole in the wall. It was a terrible location as far as efficiency for meal preparation is concerned, but at least it was away from the stove. There was no place for the inexpensive pantry we purchasd other than where it partially blocked a window. Though not the best solution, we now had practical storage. Rectangular is better.